Casey Stoner has accused a section of MotoGP fans of a "lack of respect" following his move to V8 Supercars. Two-time MotoGP champion Stoner, 27, has confirmed his deal with Red Bull Racing Australia. Stoner suffered a broken ankle last year but insists his decision has nothing to do with injuries. "We got spat at [by fans], they tried to knock us off scooters going from the motor homes to the pits," he told the Telegraph. "We had a lack of respect from a lot of people around the sport and I didn't like the direction it was taking. "Unfortunately they didn't like my honesty in the paddock. "That was part of it, but more it was the direction of the sport." The Australian, who revealed his intention to retire from MotoGP in May, tweeted confirmation of his switch to Red Bull. He said: "Very happy to have a chance to race with @redbullracingAU in the Dunlop Series this year. Looking forward to getting on track at Clipsal!" Stoner will race for the first time in the curtain-raiser to Adelaide's Clipsal 500 next month. He was MotoGP world champion in 2007 and 2011. The former Repsol Honda rider was frustrated by technical changes to MotoGP that have increased engine sizes to 1000cc from 800cc and preceded the departure of manufacturers such as Kawasaki and Suzuki from the sport. Stoner criticised the nature of the sport following the death of rider Marco Simoncelli at the Malaysian MotoGP in Sepang in 2011. He added: "We lost a rider a couple of years ago, and within a month it was like it never happened. They want to see biff and barge and they don't realise our lives are on the line. "We became puppets in that world and it had nothing to do with racing." What next for Casey Stoner? 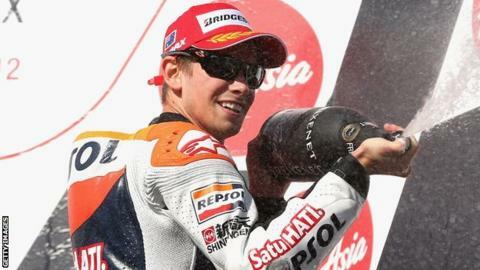 Read more on Casey Stoner: What now for the double MotoGP champion?